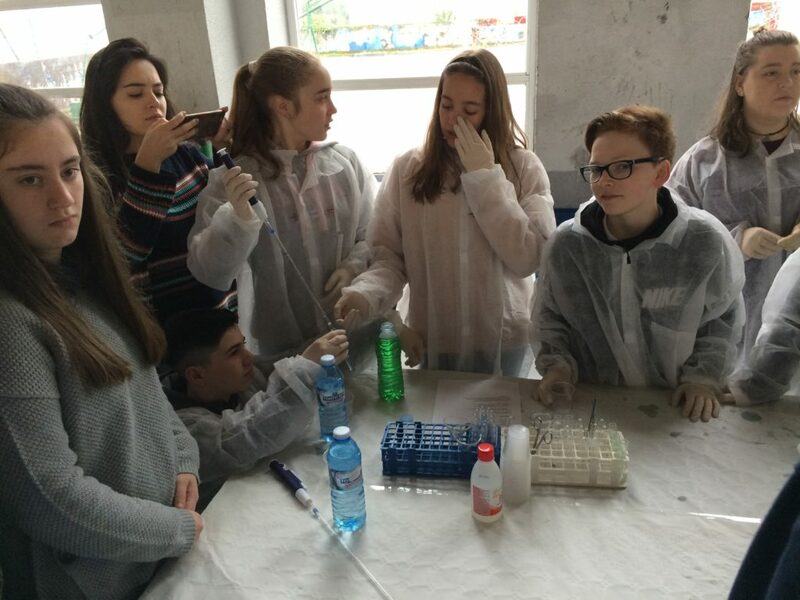 On Thursday, March 12, in the frame of the Cultural Week, the students of the Climántica’s scholar science group developed the practical experiences gathered in the didactic material about global change published under the EduCO2cean-Erasmus+ program, as well as the acquired knowledge from the investigation on the DNA which was directed by the Dr. Carracedo. 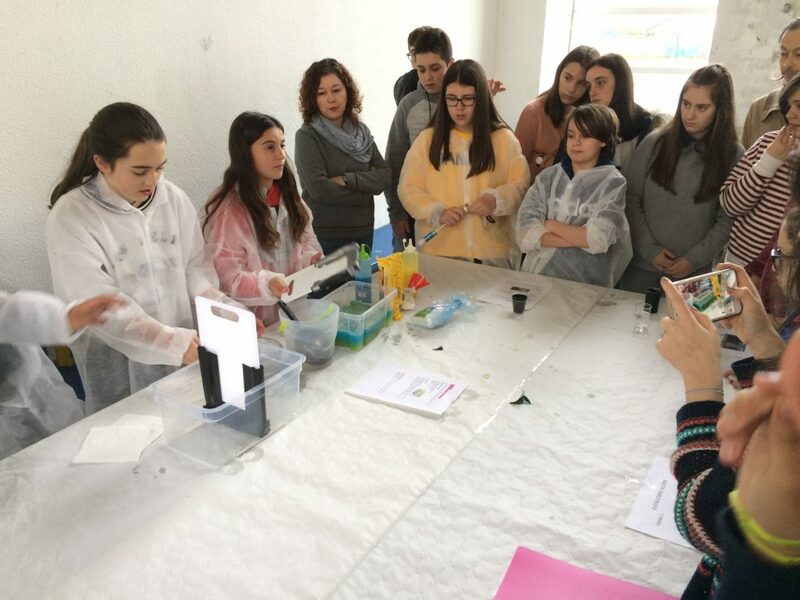 These students, coordinated by the teacher Raquel Troitiño, developed practices to show the ocean stratification, the ocean acidification and the effects of the ice melting. 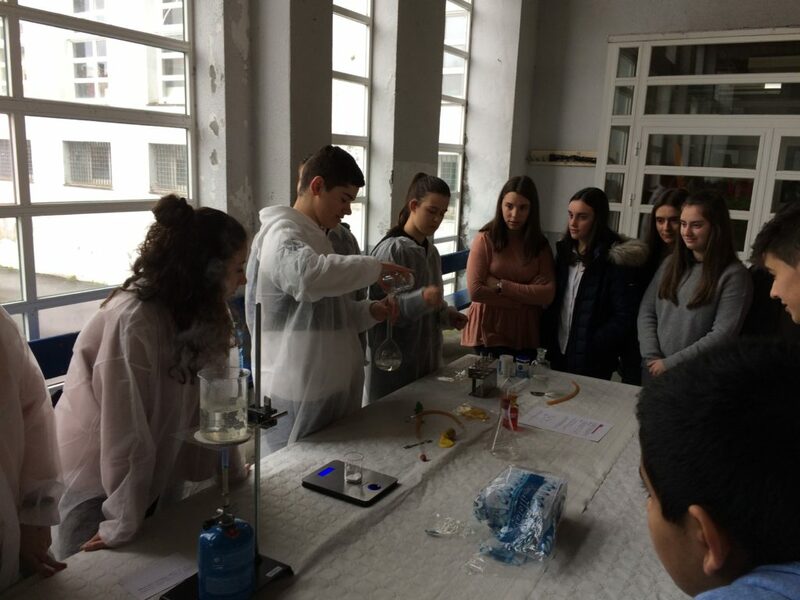 These explanations, through practical demonstrations, will be repited at the secondary school Giner de los Ríos (Lisboa) the 18th of may. During the practice of ocean stratification, the rise of nutrients from the ocean floor to the surface waters, where the phytoplankton, which is the basis of the aquatic ecosystem food chain is found, is simulated through convective flows. Then, to assimilate the implications of a change in the density of the medium in the ascent of nutrients, a layer of oil is added to the bucket with water and it is observed how the cuts of cardboard, which represent the nutrients, cannot penetrate in the surface layer of oil.In the second part of this practice the stratification of the water mass is simulated, stratification due to the difference of densities which is created by the thermal expansion of the surface water. 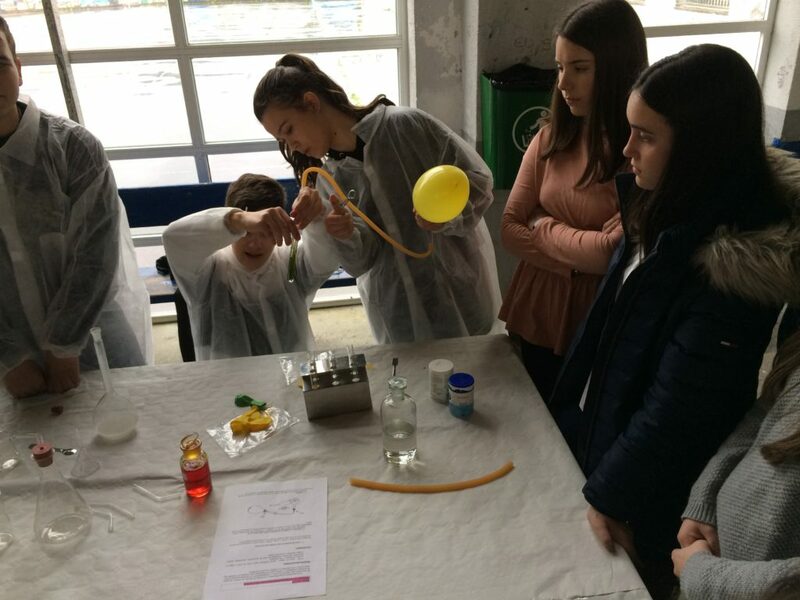 To understand the process of ocean acidification resulting from the dissolution of anthropogenic CO2 in marine water, as well as its implications for the ecosystem, an acid-base reaction with vinegar and sodium bicarbonate was performed to obtain the CO2 which, then, was dissolved in the water of one of the flasks with the help of a straw leaving the other flask with water as a reference. 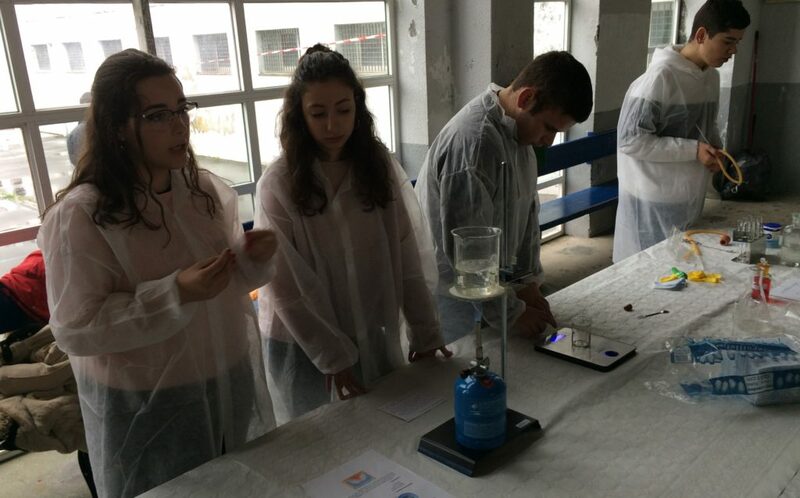 After dissolving the CO2 in water, it was added to both flasks the blue of thymolto check the decrease of pH (acidification) produced after the dissolution of CO2 in one of the flasks. The practice on ice melting was carried out in order to explain the implications of the melting of the poles in the increase of the sea level, in the increase of the ocean temperature and in the modification of the productivity. To represent the Arctic and Antarctic thaw model, a rock base which simulated the continent was placed in two buckets and water was added so that both cuvettes had the same level of water. In the case of the Arctic model, the ice cubes were placed floating on the water, whereas in the case of the Antarctic model (like Greenland and mountain glaciers), they were placed on the rocks. This way, it was observed how the thaw of the Arctic, which presents floating ice, does not produce variation in the sea level, while the thawing of the Antarctic actually does, since it presents continental ice. 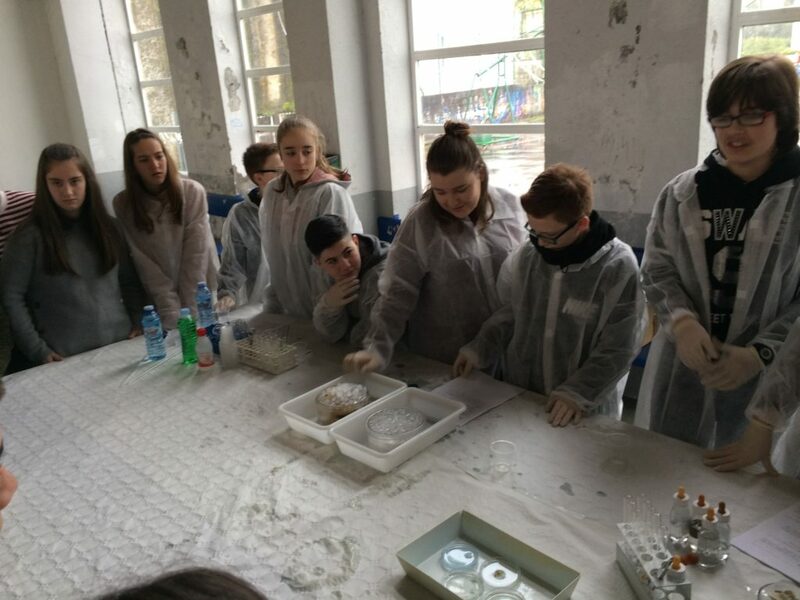 Finally, the practice on DNA was carried out following the directions which the students had learned from the Dr. Carracedo in order to study the genetic variation of the intertidal bivalves of Testal and to understand their adaptation to global change as an strategy for its conservation.